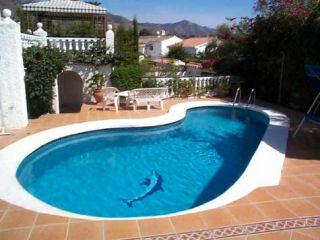 This is a fabulous three bedroom detached villa with its own private pool. It is situated in a very quiet cul de sac with no through traffic allowing you to enjoy the peace and tranquility surrounding this desirable residential area. There are superb views to the mountains and the tastefully decorated villa is set in well maintained mature gardens with barbeque, patio area with furniture and sun loungers and a gazebo for those who like shade, as well as a good size swimming pool. Inside there is a vestibule and hallway which leads to all rooms. The spacious lounge is very comfortably furnished and boasts and Adam style fireplace. An archway from this room leads to the dining area. The pristine white kitchen is modern and fully equipped complete with washing machine, microwave, full oven and hob and fridge freezer. There are three delightfully furnished bedrooms, one with an en suite bathroom. There is a further full bathroom with bath and shower over, wash hand basin, WC and bidet. The beach and town are about 15 minutes walk away from the villa, or a few minutes in the car. 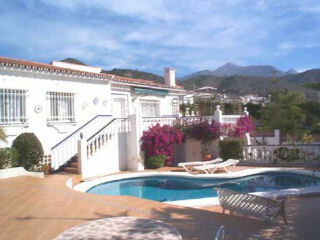 The villa is situated in a residential area to the east of the town centre called Fuente del Baden. There is a supermarket about 10 minutes walk away.